(Bloomberg) -- What’s the best recipe for making money after a huge global equities rally? One bet is to ignore the lures of a herd mentality. “We’re allergic to fashionable stocks. I’ve never been invested in Apple, Facebook, Netflix,” Raphael Pitoun, pegged to run a new international growth fund at one of Europe’s largest hedge funds, said in a phone interview. Pitoun will lead CQS New City Global Equity, a new fund to be launched in the second quarter, focusing on about 25 mid-sized and large-cap stocks. Looking at equity valuations and seeking out cheaper quality shares will be a key parameter, along with strong cash flows and earnings generation potential, he said. The goal is to return as much as 15 percent over the investment cycle. CQS, a credit-focused investment firm best-known for hedge fund strategies, now manages more money in long-only funds and is growing at a time when the assets of many of its peers are shrinking. Michael Hintze’s London-based firm had $18.4 billion of assets under management as of March 1, up from $14.6 billion at the start of last year. The firm’s flagship Directional Opportunities Fund, managed by Hintze, gained nearly 9 percent in the first quarter, according to an investor update viewed by Bloomberg. 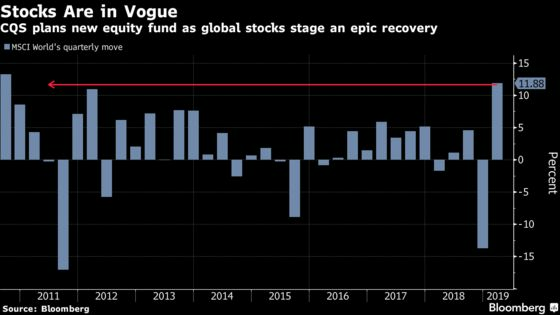 Global stocks delivered the best first quarter since 1998, with a dovish U.S. Federal Reserve and optimism that recession isn’t imminent fueling a recovery from December lows. 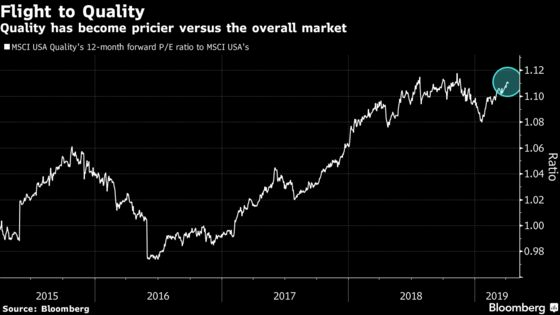 Global growth shares--companies that boast strong earnings potential--are up 17 percent this year compared to a gain of 12 percent for their cheaper-value counterparts. At the same time, some investors still reeling from last year’s losses have flocked to safer stocks offering low volatility or healthy fundamentals, making defensive assets such as quality shares pricey and crowded. The new fund’s biggest regional allocation will be for U.S. firms, with some exposure to European and Japanese companies, and its preferred sectors are industrials, health care, tech and consumer. “We’ll try to avoid the herd as much as possible,” Pitoun said. The London-based fund manager, who joined CQS from Seilern Investment Management in September, describes himself as “an old-style guy” guided by reality rather than wishful thinking.